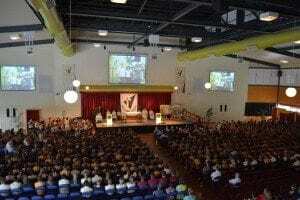 Emmanuel Catholic School was established on this site in 1983 with classes from Year 1 to Year 7. 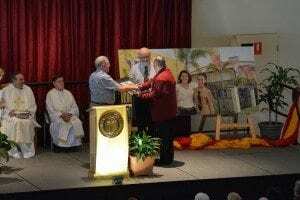 The first Principal was a Marist Sister, Sister Joan McBride. The following year, sixty students were enrolled in Year 8 (this is known as first year of enrolments for our College) and these students completed Year 10 in 1986. The school continued as a Year 1 to Year 10 school until a preschool was established in 1992. A Year 10 student, Audra Heye, designed the logo for Emmanuel Catholic School (now adopted by Emmanuel Catholic Primary School) in 1986. The school took part in a Renewal Process in 1990, which resulted in a name change from Emmanuel Catholic School to Emmanuel College. A second renewal in 1995 recommended that Emmanuel College be discontinued and in its place two schools be established – Emmanuel Catholic Primary School for Pre-school to Year 7 students and Holy Spirit College for students from Years 8 to 12. The Cross Central to Christian beliefs is the fact that Jesus redeemed mankind by his death on the cross. Without the cross there can be no resurrection. The Dove A symbol of the Holy Spirit actively watching over us (wings moving) and guiding us through life’s journey. The rays are a sign of God’s grace given through the Spirit. The Triangle Solidarity with God but it also can be interpreted as a road or a ladder that takes us towards God. The triangle does not represent the Trinity as it is not equilateral. 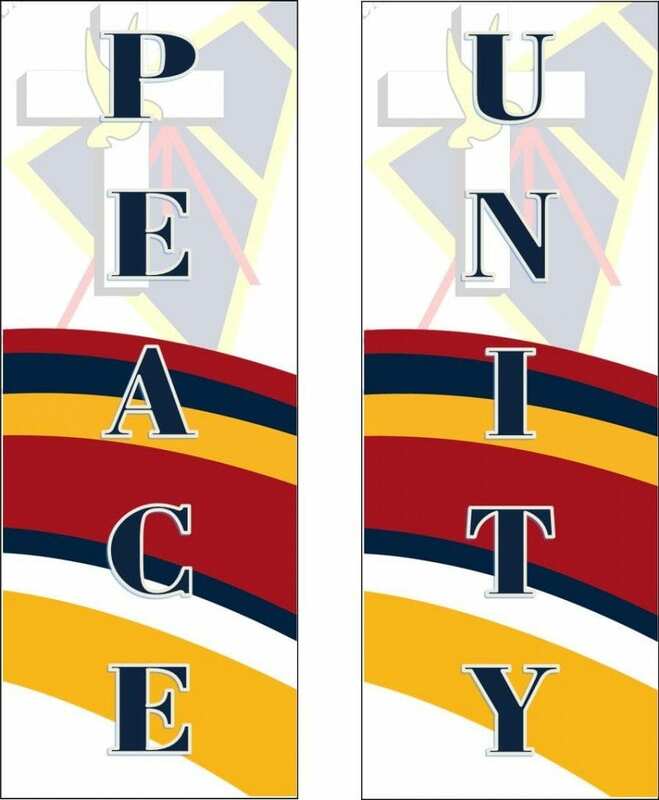 The words “Peace and Unity” were chosen for the logo because they occur frequently in the Mass for Pentecost Sunday – the feast day of the Holy Spirit. For this reason, the College feast day is held on the Friday before Pentecost. The opening prayer of the vigil Mass begins “Let us pray that the Holy Spirit may bring peace and unity to all mankind”. 2014 marks 30 Years of Secondary Schooling at HSC! Our first Year 8 students enrolled in 1984. 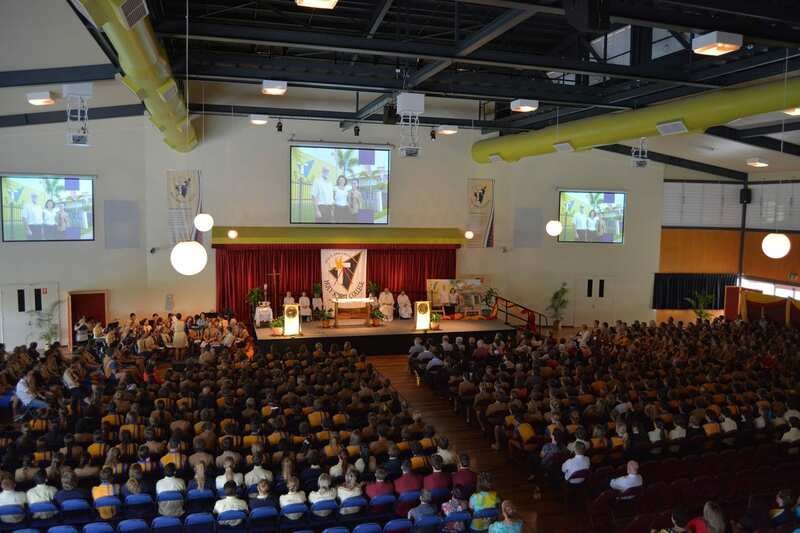 Celebrations were held in May 2014 with past and present students and staff to commemorate this important occasion. Current Principal of HSC, Dr John Lyons, receives a commemorative gift to celebrate 30 Years of Secondary Schooling from past HSC Principals, Mr Michael O’Brien and Mr Vince McSherry. Click Here for the 30 points of our College History from the Principal’s Speech, Dr John Lyons, at the Feast Day Mass on 23 May 2014.